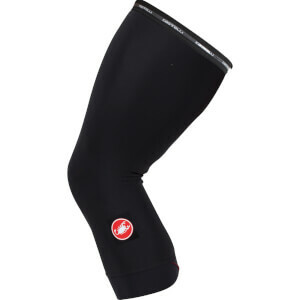 Stay dry, stay warm with the PBK Water Repellent Knee Warmers. The rain beads off the material and our fast drying fleece keeps you warm and dry due to the extremely fast wicking properties. Perfect for Spring and Autumn days, the fleece lined knee warmers keep your knees warm and dry on the chilly days where rain threatens. The outer layer repels all but the heaviest of rain showers and the fleece lined inner fabric keeps you warm and wicks sweat away to ensure you stay dry throughout your ride. Lives up to its billing. Well made and fits well. Doesn't slip and water beads off of it.